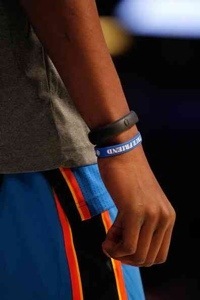 NBA basketball player Kevin Durant wearing the Nike+FuelBand. The age of cyborgs is arriving, but quietly and without the violence and invasiveness of the Terminator or The Borg. Certainly there are surgically implanted devices under development for everything from the automatic administration of drugs such as insulin to artificial organs and bionic body parts. What’s happening more subtly but in many ways just as powerfully is with instruments that are wrapped around our wrists and apps that connect to our physical activities. Theses devices and apps are not just monitoring our activities, they’re turning our bodies into data producing devices that can be monitored and managed. The following are three such wrist-worn sensors. The Nike+FuelBand fitness tracker wrist band uses a formula invented by Nike to calculate activity levels based on gender and weight by tracking yours steps, time taken engaged in activities, fuel, and calories burned. The data is wirelessly transmitted to your web based account and/or an app on your smart phone. The Jawbone UP band measures food intake, sleep, mood, steps taken, and calories burned. It’s smart feedback includes tracking your daily activities and rhythms in order to tell you when it would be most beneficial to sleep, to wake up, eat and exercise. It’s connected to an extensive food database so that food items you eat can be entered by name, by photo, or by scanning a bar code with your phone’s camera. Unlike the Nike+FuelBand, it is not wireless and thus it must be synced by plugging it into an Apple iOS or Android phone or tablet. The Fitbit Flex is similar to the Jawbone UP in that it tracks your eating, sleeping and physical activities. Sleeping and food cycles must be logged online. However, it is wireless and beams the data to your smart phone or tablet, and you can connect with friends who also use the Fitbit to share data about your routines. In a sense it turns the body into social media device. There are also a slew of smart apps coming out for measuring and data basing the body. Cardiio measures heart rate, Ginger.io tracks activity and performs behavior analytics, inFlow and Mood Panda track and measure moods and emotional health. Stress Check measures stress levels via heart rate. These devices and apps are rudimentary compared to what’s coming in the next five years. As chips and circuits get smaller there will be stick-on sensors the size of a small adhesive bandage. High end clothes will have built-in sensors in the synthetic fabric that will wireless beam data to the cloud. Further, these smart fabrics will generate electrostatic electricity to keep the sensors and our devices charged. The wrist bands and Google Glass we have now will seem clunky and cumbersome compared to the ubiquitous, invisible and unobtrusive sensors coming soon. This is the age of big data, and even things that seem messy and unmathematical like biology and our bodies are a part of that. Figure out how to measure and quantify, and you’ve got data to sync to the cloud. Our bodies are biological machines with rhythms, functions and mechanics, and by interfacing them with these sensors we can be cyborgs without a single surgical implant, by plugging in all that data to our other devices. The body becomes another device like our smart phone and tablet that gets synced with all our other devices and with the big data cloud. What’s extremely powerful about this notion is an explosion of self knowledge that can lead to healthier lifestyle choices. When we eat a hamburger and drink a cola we don’t think about or see data visualization about the growth hormones and saturated fats in the beef, or the high fructose corn syrup in the soft drink. But if our body is a device synced to the cloud, we can. It’s as powerful as the real time gas mileage visualizer on the screens in many hybrid cars. When drivers see the real time result of their behavior on the gas mileage of their car, they tend to change their behavior. Game play results, as many drivers play at how they can get the best gas mileage. It can work the same way with our personal health, particularly if linked to social media so you can share your healthy choices with your friends and family, all through measuring, calculating and visualizing data. Physicist Max Tegmark says, “Our reality isn’t just described by mathematics–it is mathematics, in a very specific sense.” What will designers do with that reality? To keep pace with innovation the UX designers of today need to be fluent in big data and ubiquitous computing. That doesn’t mean that they have to be mathematicians, but it does mean that design thinking must embrace a reality that IS mathematics, a reality where the human body can be another the ultimate device synced to the cloud. This entry was posted in Design on November 27, 2013 by Editor. Convergence is Done. This is What’s Next. The New York Times on an iPhone. A couple of months ago I received a group email from a media studies instructor with a link to a story about Twitter reporting on Super Bowl advertisements, and the sender declared it to be “Convergence in the media!! !” (Yes, there were three exclamation marks). I scratched my head at this, because it was just flat out wrong. Twitter talking about and allowing users to rate television ads is not “convergence.” But the word convergence has become such a trendy buzz word in media studies that even an instructor in the subject can misuse it. So let me set the record straight: convergence is a phenomenon that began with the explosion of the world wide web, and particularly enabled by the spread of wifi networks and portable computing, where information technologies and mass media become so interconnected that they merge. Convergence has transformed entire industries. For instance, since news organizations have started distributing their product on websites, tablets and phones, they have expanded the types of media they distribute. Now newspaper journalists not only write stories, they also shoot and edit videos that can be instantly streamed online. That’s convergence. Twitter buying some TV commercials isn’t. Ads for the iPod were a template for how to design video content for the devices. In the early 2000s I gave a series of lectures on how trends in convergence and multi-modality (the delivery of the same media in different formats across different devices) were changing the aesthetics of media. For instance, the design of news websites, with their multiple layers of information and software-style interface, fundamentally changed the look of television news. Compare the look of a news broadcast from the 1980s to one today and the difference is enormous. In the old style the news anchor is sitting in a physical studio in front of a camera. In the new style the news anchor is embedded between layers of information windows and motion graphics, essentially placed within a software interface. At the same time, a single device fundamentally changed the aesthitics of video: the Apple iPod. Once people started watching music videos in the palms of their hands, the old cinematic style of music videos was replaced with a stark, flat, software-style aesthetic. The micro-screen now rules over the cinema screen, and the affects this has had over media design was fundamental. I predicted that these trends would spell the end of skeuomorphism in design. Skeuomorphism is where designed elements mimic physical objects or textures in the real world. So for example the contacts application on your computer would be designed to look like an actual leather-bound address book. The new paradigm is called flat design. Flat design is driven by a philosophy of simplicity and clarity, but even more so it is driven by necessity. Like music videos viewed on palm-held devices, user interfaces have to be easy to see on micro-screens and easy to operate with your thumb. Flat design is a beautiful necessity. Form follows function. Flat design in the Windows 8 OS. Convergence has happened. Multimodality is the norm. Skeuomorphism has died (granted, it took a bit longer than I thought, and I didn’t expect Microsoft with their Windows 8 OS to beat Apple to the punch!) Flat design is the new design. These were the trends that drove the first decade of the 21st century. So what’s next? Increasingly, the media and design landscapes are being shaped by the interactions between media, and are driven less by physical product designs such as the iPod or iPhone and more by apps. But with apps it’s not about the design of a singular app, it’s about the synergies between apps. Apps can hook into each other. If I design an app that needs to make use of maps and GPS functions, I don’t have to reinvent those functions, I can simply hook into the existing map app on the device I’m designing for, and the existing GPS functions on the physical device. Further, a lot of innovation in apps is how they tie into existing physical functions in our world, like apps that do our banking for us, apps for making restaurant reservations, apps that manage our automobile insurance (including using your phone’s camera to file insurance claims), etc. Synergy is trend happening now. The Nest thermostat and app. Synergies not only tie apps to each other and our digital and physical worlds together, but also change our perceptions of the things we use. For instance, the Nest thermostat fundamentally changes the concept of a thermostat from an HVAC controller in our home to an interactive networked device that learns our behaviors and is tethered to our phones and computers. That designers now design not just products but synergies and interactions and reconceptualize the old paradigms of things in our lives into interconnected devices, means that every designer must be an expert in User Experience (UX) design. What makes the Nest thermostat paradigm-shifting is it’s UX. UX has the power to transform anything. If you ever get a chance to sit in the cockpit of a Tesla electric car, you’ll see that the car wasn’t just designed with good ergonomics, it was design with good UX. This means everything about the user’s lifestyle is taken into account. The Tesla isn’t just a fancy electric car, it’s a device (one that can actually run apps on it’s enormous center-console touchscreen interface). Square isn’t just a credit card swiper for iPhones, it’s a new UX that creates financial synergies and makes our money a part of our devices. Designers, take note: the next decade is and will be driven by synergies and UX. This entry was posted in Design on November 14, 2013 by Editor.